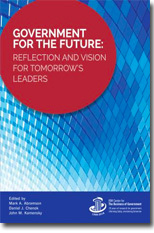 Government for the Future: Reflection and Vision for Tomorrow's Leaders (with Dan Chenok and John Kamensky). Rowman & Littlefield, Inc., 2018. 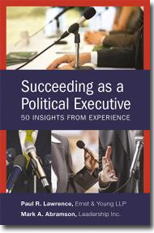 Succeeding as a Political Executive: Fifty Insights from Experience (with Paul Lawrence). Rowman & Littlefield, Inc., 2016. 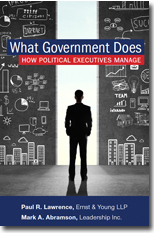 What Government Does: How Political Executives Management (with Paul Lawrence). Rowman & Littlefield, Inc., 2014. Getting it Done: A Guide for Government Executives (with Dan Chenok and John Kamensky). Rowman & Littlefield, Inc., 2016. Paths to Making a Difference: Leading in Government (with Paul R. Lawrence). Lanham: Rowman & Littlefield Publishers, Inc., 2013. Getting it Done: A Guide for Government Executives (with Jonathan D. Breul, John M. Kamensky, and G. Martin Wagner). Lanham: Rowman & Littlefield Publishers, Inc., 2009. The Operators Manual for the New Administration (with Jonathan D. Breul, John M. Kamensky, and G. Martin Wagner). Lanham: Rowman & Littlefield Publishers, Inc., 2008. Learning the Ropes: Insights for Political Appointees (with Paul R. Lawrence). Lanham: Rowman & Littlefield Publishers, Inc., 2005. New Ways of Doing Business (with Ann M. Kieffaber). Lanham: Rowman & Littlefield Publishers, Inc., 2003. The Procurement Revolution (with Roland S. Harris III). Lanham: Rowman & Littlefield Publishers, Inc., 2003. E-Government 2003 (with Therese L. Morin). Lanham: Rowman & Littlefield Publishers, Inc., 2002. Human Capital 2002 (with Nicole Willenz Gardner). Lanham: Rowman & Littlefield Publishers, Inc., 2002. Innovation (with Ian Littman). Lanham: Rowman & Littlefield Publishers, Inc., 2002. Leaders (with Kevin M. Bacon). Lanham: Rowman & Littlefield Publishers, Inc., 2002. Managing for Results 2002 (with John Kamensky). Lanham: Rowman & Littlefield Publishers, Inc., 2001. E-Government 2001 (with Grady E. Means). Lanham: Rowman & Littlefield Publishers, Inc., 2001. Memos to the President: Management Advice from the Nation's Top Public Administrators. Lanham: Rowman & Littlefield Publishers, Inc., 2001. Transforming Organizations (with Paul R. Lawrence). Lanham: Rowman & Littlefield Publishers, Inc., 2001. Performance and Credibility: Developing Excellence in Public and Nonprofit Organizations (With Joseph S. Wholey and Christopher Bellavita), Lexington: Lexington Books, 1986. The Federal Funding of Social Knowledge Production and Application, Volume 2 of the Study Project on Social Research and Development, National Academy of Sciences-National Research, Washington, D.C., 1978.